So there I am, proudly admiring the hardback of the fifth Alex Mavros novel, The Green Lady. It has a great jacket, showing the Temple of Apollo at Delphi under louring skies – nothing to do with me, I hasten to add. The designer picked up on all the main themes of the book. Murder at the ancient site of Delphi, check. Industrial pollution from a fictional bauxite plant not far to the south, check (black clouds above the temple’s columns, the latter resembling vintage chimneys). Paedophilia involving underage girls, check (those decrepit but still erect columns again). The Olympic Games of 2004, er, not check; but it doesn’t matter as the stadium in Delphi isn’t far from the temple. Then I log on to Facebook and see that a friend has called The Green Lady ‘the Greek Jimmy Savile story’. Which, in terms of the rich and powerful abusing innocents, it is - but I hadn’t made the connection myself. Only goes to show how disconnected authors get from their works after they’ve done the proof reading. I mentioned the Olympic Games. I thought that would be the obvious link between a novel set in 2004 and the current year of our Farah, Ennis and Rutherford (and some reasonable foreign athletes). Danny Boyle helped with his amazing self-erecting chimneys, though the jacket was designed before them – hang on, let me check – yes, it was. More serendipity. Anyway, I used the Athens Olympics as a backdrop to bring out the fraud and profiteering that went on during the preparations and played a part in Greece’s ongoing financial crisis. There hasn’t been much negative feedback about the London Olympics yet, but there will be when the accounts are filed. They cost the tax payer WHAT? I do several things in the Mavros series. One is to change location within Greece each time, a trick I learned (well, nicked) from Michael Dibdin’s Aurelio Zen series. That ups the pressure on the protagonist, who has to cope quickly with local conditions and unfamiliar ways of doing things. Another is to bring different characters in as Mavros’s sidekicks. As a missing persons specialist, he’s a lone wolf, but he needs specialist support in each case. This time the role of hands-on co-investigator and muscle (well, weight) is played by the Fat Man, Mavros’s communist friend, former coffee shop owner and complete non-specialist. He’s also mouthy, which is good (I hope) for the quip and banter content. Finally, I like to change the nature of the book. In the past there have been an enclosed space mystery (Crying Blue Murder, on a small island), a political thriller (The Last Red Death), a gangster story (The Golden Silence), and an investigation into the ongoing effects of the Second World War (The Silver Stain). 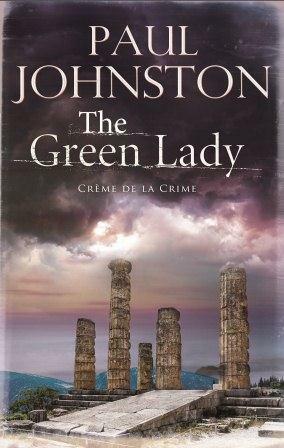 This novel makes use of Greek mythology, in particular the Demeter (the Green Lady of the title) and Persephone story, as its narrative and symbolic, what’s the word, oh yes, skeleton. The fact that a small number of contemporary Greeks actually worship the Olympian gods was, er…ambrosia from that mountain further north. Unfortunately for them – and this is in no way linked to my lifelong atheism (I refused to be baptised when I was only three months old) – several end up being murdered in very unpleasant ways. This gets in the way of Mavros’s investigation, which involves a missing girl - until he begins to realise that everything is part of the same, deeply nasty case. Even Hades, king of the dead, is involved – but then he’s in all crime fiction in one guise or another. So, the Greek Jimmy Savile story. Arg. How could I write anything so vile?